7:13am, Cape Town: I was woken by a strange rumbling noise and made it to the patio door just in time to see half of the furniture from the rooftop deck sliding past my room. It was as the last chair flew by, and its cushions were whipped into the air and over the side of the building, that I knew today was going to be a good day for wind. 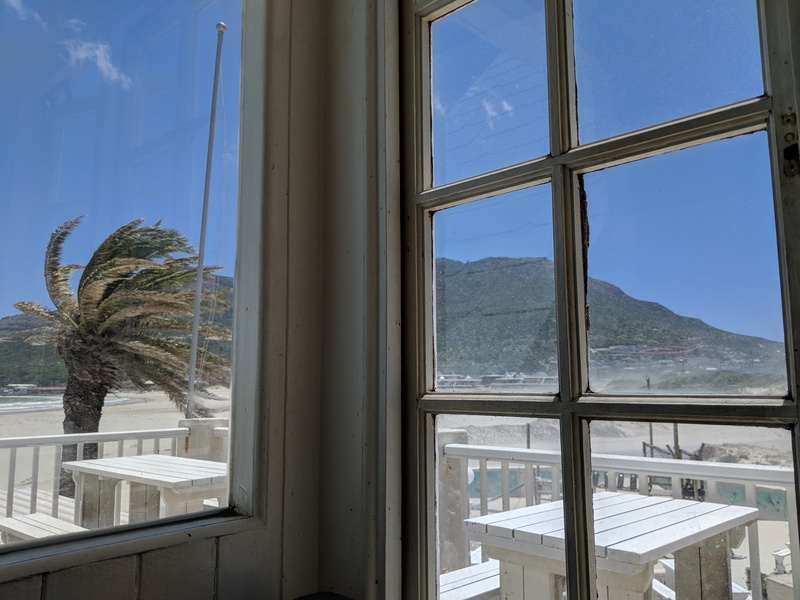 I’m leaving the city for a couple of days and heading south a bit down the Cape to Hout Bay because it looked nice on google maps and there hasn’t been a riot there since September. 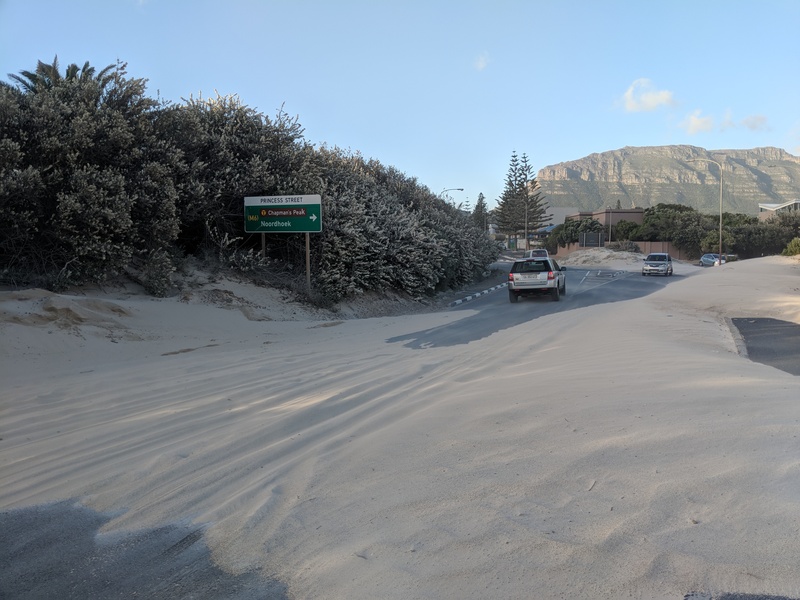 I got off the bus near a roundabout at the bottom of Victoria Avenue, and noticed, as it literally slapped me in the face, that most of the beach (which I couldn’t yet see) was airborne and travelling at speed. I took a video of this as it seemed like a noteworthy moment, although I was later to realise that flying sand was to be the theme of the morning and also most of the afternoon. Here’s the video anyway so you can appreciate my exact first impression of the town that was to be my home for the next three days. It was still the morning and, since I couldn’t check into my beachfront guesthouse until 2pm, I had a whole bunch of hours to kill. I had originally intended to spend this time half asleep on some soft white sand but something’s telling me that that’s not such a good plan today. This wind was not going to stop me having a nice old explore, though, and I found some shrubs I could walk alongside to shelter form the sand. I go where the shrubs go. The shrubs take me along a main road which gets boring pretty fast, so I swing a right at a point where the sand doesn’t seem so wild and head down a road that I think takes me to a bar I saw on Maps earlier. I spot the bar. It looks nice. It’s a beach bar, appropriately called Dunes, and I presume access is from the beach side, so I walk round the building to go in the front door. This was a terrible idea. Without the shelter of the building the wind at the beach is insane and it’s created all sorts of sand-based obstacles to getting into the bar. One, I can’t see a thing because I have to have my eyes shut 90% of the time to avoid retinal sandblasting. Two, I can’t really breathe unless I’m facing away from the wind with my mouth down my collar and this makes walking tricky. Three, there are now two newly-formed sand dunes blocking the entrance to the bar that, because of issues one and two, must be conquered blind and sideways. After a moderately traumatising excursion over the dunes and through the gates (at one point I was on my knees, blind, unable to breathe and somewhat convinced I was actually going to die there and then halfway up the front path of a bar), I made it, shook the sand off me, scraped some out of my eyes, and ordered a goddamn pint. No way was I leaving until the wind stopped. 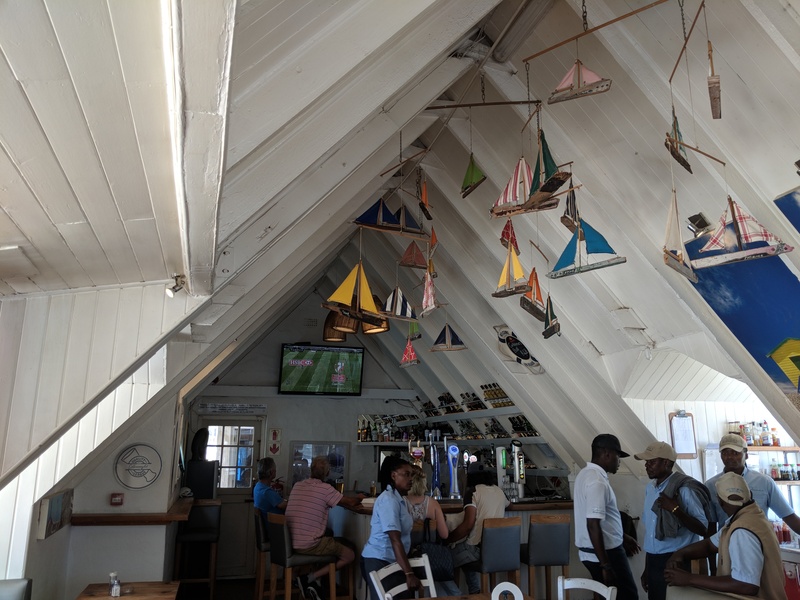 Which was fine by me because this is a bar and there is beer and food, and I can see the beautiful beach from a safely sheltered spot behind a quaint latticed window. And it was not boring in the bar either. The bartender/owner kept having to rush out to tow stuck cars out of sand drifts with his Land Cruiser. And then, a couple of hours into my refuge, a dog needed rescuing from outside. Somebody in the bar knew that the the dog apparently belonged to “the most useless drunk in Hout Bay”. It was scurrying around on the upper deck in the middle of the sandstorm and everybody was very concerned, so we joined efforts to lure him to the window I was sitting next to, catch him, and then somebody went out to brave the wind and return him to his owner. It was all very exciting. Then I had nachos. The dog heroics had brought everybody in the bar together, so I had people to talk to for the rest of my time sheltering there. I also had time to charge my phone, flip through my Cape Town guide book (discovering that there is a PENGUIN COLONY not far south from here! ), and watch the rugby sevens on the telly until I decided that the wind had died down enough that I could go outside. I also went out the back door this time which so was conveniently sheltered by the building as I made my way to my guesthouse. There are bits of beach everywhere, mostly on this road and in my hair. The guesthouse was a beaut. 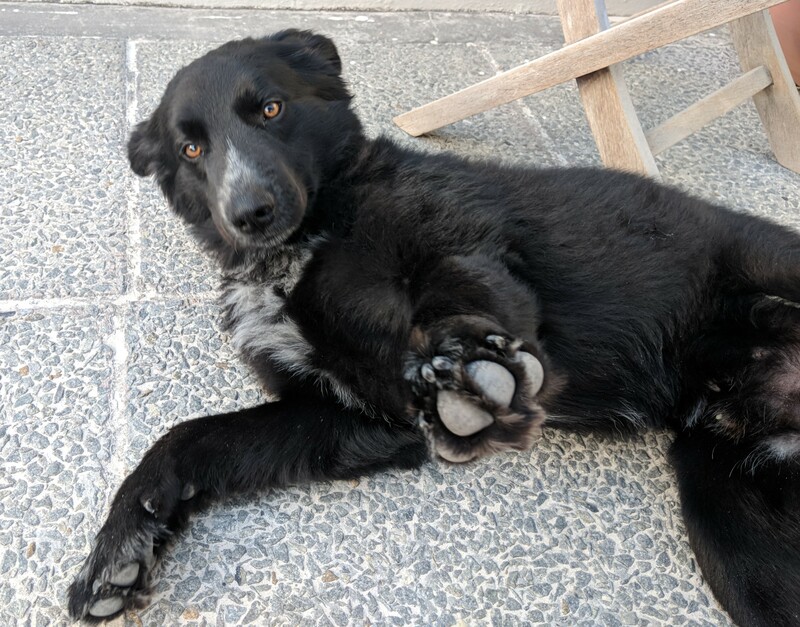 I was greeted by Max, a large black dog who flopped down and rolled over as soon as I started petting him. I also got an upgrade to a large room with french doors on to the side patio and a giant bed. My visit to Hout Bay is looking up! After doing my bestest to get the sand out of all my orifices while still adhering to Cape Town’s strict water saving regulations (we’re in a drought, guys), I committed myself to braving the elements again and heading to the beach. It’s still super blowy so the place is deserted, but the wind has whipped up all sorts of cool dune formations, and I think the sand flying about at ankle level looks kinda cool even if it is exfoliating my legs more than I would have liked. And when I finally to the beach, it is beautiful. Nothing like a wild, foaming sea to remind you of the power of the ocean. And the sun is setting behind some mountains which is jolly nice. 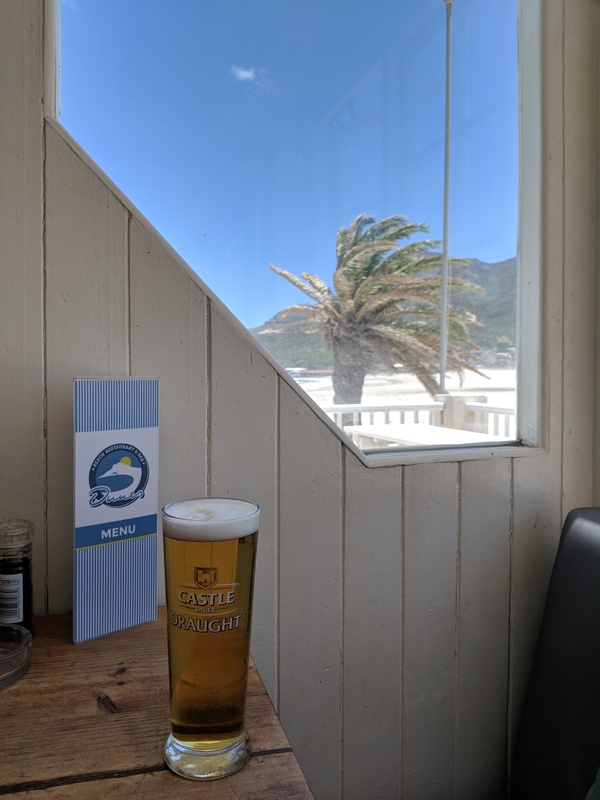 The silver lining of all this wind (in addition to the fact that it made for a very interesting day) is that whilst sheltering at the beach bar I had some rare free time to read my guide book, which led to my discovery of the PENGUIN COLONY just down the Cape in Simon’s Town. The rest of the night will be spent planning tomorrow’s excursion there!